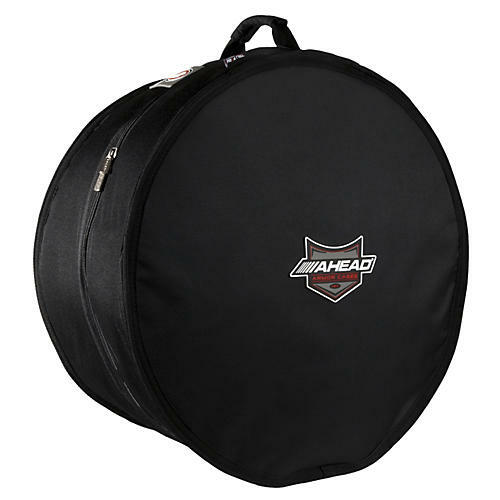 Ahead Armor Cases Woofer Drum Case 22 x 8 in. Earn up to 912 reward points. A hyper-durable and portable drum case for the active drummer. Offering a weatherproof, double-stitched polyester exterior and tensile strength, this Ahead Armor Woofer Drum Case has some innovative features that are worth a detailed investigation. This case features the trademark Ahead "DX-Core": two layers of high-impact foam padding and a soft interior lining of premium Sherpa Fleece. This feature offers the snugness and smaller dimensions of soft cases, while still retaining the resistance and strength of hard plastic cases. Another great feature can be found by looking at the shape of the cases themselves: they are designed to hold not just the drum, but the mounted hardware as well; no need to shove your expensive drum into a case that just doesn't quite fit.